You'll be £11.99 closer to your next £10.00 credit when you purchase Tank Destroyer. What's this? In this heavily illustrated volume in the TankCraft series Dennis Oliver focuses on the Achilles – the British variant of the American M10 – which was one of the most important Allied tank destroyers of the Second World War. It played a key role in the armoured battles fought on the Western Front, in particular in France, the Low Countries, Germany and Italy. Built on an adapted Sherman chassis, with sloped armour, an open-topped turret and powerful 17-pounder gun, it was designed to counter the threat posed by the formidable panzers deployed by the German army towards the end of the conflict, in particular the Panther and Tiger tanks. A key section displays available model kits and aftermarket products, complemented by a gallery of beautifully constructed and painted models in various scales. Technical details as well as modifications introduced during production and in the field are also examined providing everything the modeller needs to recreate an accurate representation of these historic armoured fighting vehicles. Together with Pen & Sword Books, Dennis Oliver produces a book that is very useful for the historian, the enthusiast and the model maker. This all makes for some very interesting reading and I must admit, not being a gunner made this all the more interesting for me. I have finally cleared up several mysteries concerning the rather obscure numbering systems on the unit/formation signs which the Artillery lads dreamt up to confuse the rest of the Army. As well as excellent drawings, their is a wealth of action photos, maps and information. 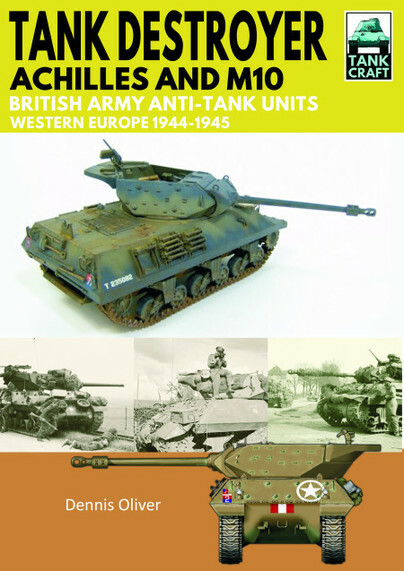 This book will be of enormous value to anyone wishing to build a model of the Achilles or even the M10. Highly recommended to model makers. This book is well written and an informative title on the M10... The contents cover a broad spectrum for the modeller to get their teeth into from the units that used the M10 to the where and when, and also the models available to the details on the M10 that you may wish to check or replicate. The period photographs provided are good quality and have very good captions with them. This particular book excels in 2 things for me….. First and foremost the extensive middle part showing a large number of model kits and brands, of complete kits and if aftermarket additions and details. And here I must mention too the large number of close-up photos of some of the wonderful builds of finished kits. Very interesting for modelers like me. Also interesting to see the rather large number of 1/48 scale kits of this vehicle. The second interesting part for me are the pages showing the composition of the various anti-tank regiments. Very informative. And then of course there is the general short history of how this weapon came in to being into the British Army, and it’s actions starting in Normandy and all the way into northern Germany. There are quite a few interesting photos of the actions too, showing what the Achilles and its M10 brothers looked like in battle. Yet another great book for modelers…… ! It follows the basic format of these TankCraft books and provides lots of good reference information for both armour historians and modellers alike.